The Google Chrome occasionally shows “DNS Server Not responding” error while browsing the internet. This is, of course, annoying because the error doesn’t actually tell us its cause and the culprit. And, unlike other errors in Google Chrome, this one is fairly common. Clearing browser data and the cache also doesn’t fix the problem and will obviously result in data loss. So, in this post, I’ll be discussing the method for solving the DNS server not responding error in Chrome. Before diving into more intricate details, we must first check whether the website you are trying to access is even available online or not. The thing is that sometimes because of a lot of load or server malfunction or other technical difficulties, sometimes, a website can go down. In that case, the Google Chrome won’t be able to find the website on the internet and will tell you that the DNS Server is not responding. Using these services is of course very easy and free. All you have to do is head over to any one of these sites and just enter the URL of the website that you are trying to access. Among these three, my preferred one is CurrentlyDown and I regularly use this website to check if some website has a reliable uptime or not. It shows you the availability history or the website, the response codes that the website sent to everyone when it was down along with the location map showing the countries where the website was down. 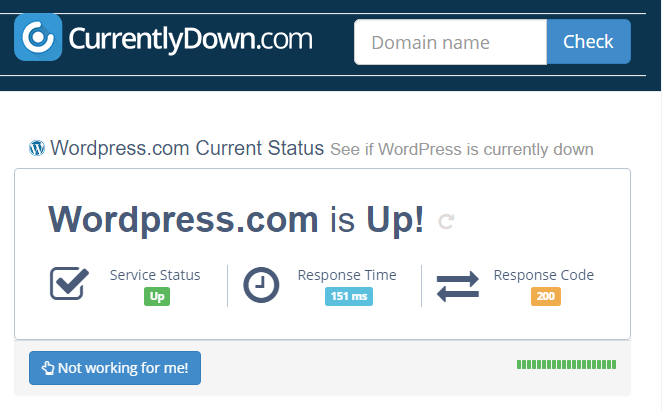 If the website shows as down, then you can be assured that the problem is not on your side. Wait for a few minutes/hours for that website to get back online. If the website shows as UP on CurrentlyDown, then there could be a problem on your PC. Wait for a few minutes/hours for that website to get back online. If the website shows as UP on CurrentlyDown, then there could be a problem on your PC. All your requests for every website that you browse go through DNS servers. These servers assign names to the websites which otherwise are actually just IP addresses on the web. for example, Google.com has an IP address of 216.58.211.142. And this is the only thing that the computers know about Google’s domain name. Whenever you enter google.com on your address bar, the request goes to a Recursive DNS server and then asks it for the actual IP address of that website. You can learn more about DNS in the video below. Of course, all this is very time consuming if the PC asks the same DNS information from the servers again and again. This is why DNS cache is used. It temporarily stores the domain names (website address) and their IP address on your PC so that it won’t have to ask for the same information repeatedly. Sometimes, this data gets messed up and this is why you will see DNS Server not responding error in Chrome. We can clear the DNS cache to fix this. Press Windows + X to open the Start menu context menu. Press A to open the Command Prompt as Administrator. Accept the UAC prompt. In the command prompt window, type ipconfig /flushdns and press Enter. 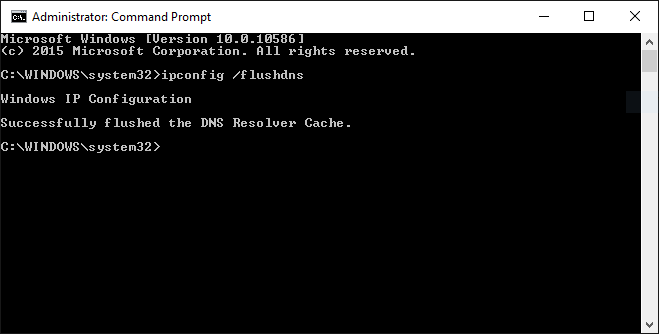 If everything goes well, the command prompt window should show “Windows IP configuration successfully flushed the DNS Resolver Cache.” Try opening the website that you were trying to access and see if it opens how or not. Some antiviruses have started providing Web security plugins these days and this can hinder your browsing if the website that you are trying to access is in the blacklist of that security suite. The two I use are AVG antivirus and Malwarebytes AntiMalware and both of them have the options to block malicious websites that can harm your PC. If flushing the DNS cache doesn’t fix the problem, it might be your antivirus which is blocking the website. You can try temporarily disabling them and see if the website opens or not. 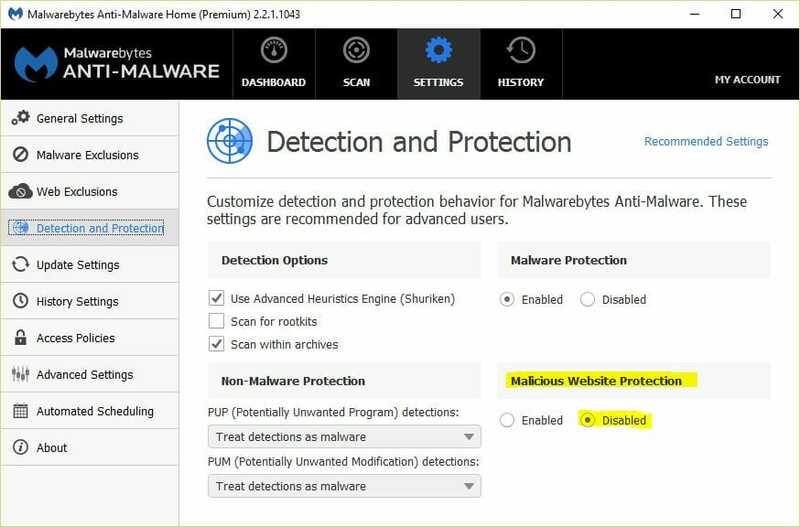 I’ll show you the process of disabling web protection in Malwarebytes Antimalware so that you can get the idea on how to do it on your PC. Press the Windows and type Malwarebytes. Open the Malwarebytes Antimalware Notifications app and accept the UAC. In the Malwarebytes window, go to the SETTINGS > Detections and Protection. Click on the Disabled radio button on Malicious Website Protection header. Doing this will disable the web protection that Malwarebytes provides by monitoring the websites you visit. Almost all antiviruses and anti-malware will have their settings in this way. You can ask me in the comments on how to do this for your particular antivirus if you find trouble doing this. If all other methods fail, this is the one which will save your day. It could be possible that your ISP might have blocked the website with some obscure method which is causing the DNS Server not responding error in Chrome. To counteract this, you can simply switch the DNS server your ISP provides with Google DNS or Open DNS. Both of them are free to use and provide an excellent way to get past this annoying censorship. Howtogeek has an excellent article explaining the method for switching DNS on your PC with step by step guide alongside. So, you just have to follow the steps given in that guide and the website that you are trying to visit will start working perfectly. This will fix the DNS server not responding error in Google Chrome. I must’ve done something using Malwarebytes, because the only time google search works for me is when I’ve disabled the antivirus software or deleted it. Which antivirus are you using? Windows defender (which comes preinstalled in Windows 10) is enough. Remove all others.